Healthy populations of cutthroat trout have fall young-of-year (YOY) densities of 200 to 2000 YOY per km. 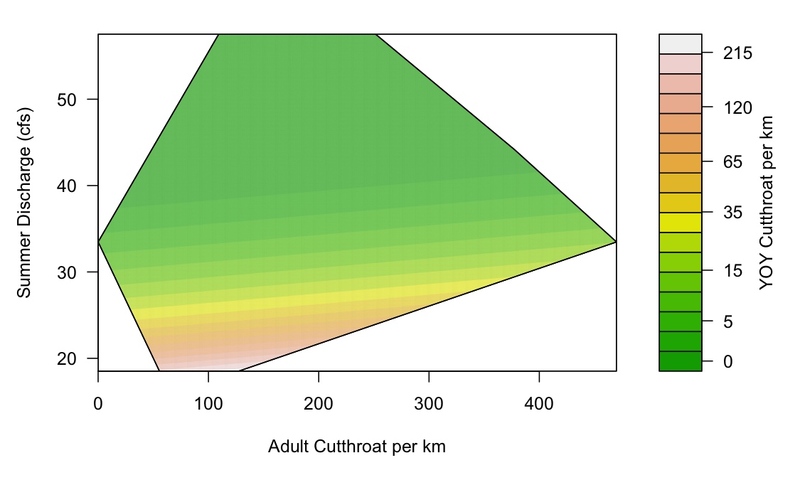 We predicted YOY (around 60-80mm or 2.4-3.1″) cutthroat trout density (number per km; filled contour) across adult (>200mm or 7.9″) cutthroat trout density (number per km) and summer discharge (cfs) above the Syar tunnel outlet using UT-DWR observations from 2002-2011 and our 2016 observations. We see recruitment is non-existent above 30 cfs, but approaches natural levels at less than 20 cfs. Model predictions are constrained to a convex hull of the observed ranges of adult density and discharge. Water has been moved from the Colorado Basin to the Great Basin for the last 100 years to meet central Utah’s water needs. Once in Utah, the water was transferred from Strawberry Reservoir to urban areas of Utah County through previously existing rivers and streams. At the onset of this endeavor, the headwater tributary, which likely was intermittent with flows that rarely exceeded 10-15 cubic feet of water per second (cfs), was exposed to flows of 400 cfs. These excessive flows resulted in drastically altered erosion and sedimentation rates as well as severely altered natural flow regimes that ramified through the ecosystem. Since the onset of the project, a series of tunnels have been constructed that would allow the Bureau of Reclamation to reduce flows entering the streams and rivers. I am a part of an interdisciplinary team evaluating the effects of altered flow regimes on Sixth Water Creek and Diamond Fork River, UT, tributaries of Spanish Fork River, UT. Collectively, our research team is evaluating the effect of flow on temperature, geomorphology, biology, and ecosystem metabolism. Our laboratory’s efforts focus on the effect of altered habitat, temperature, and prey base on the production potential of the fish community and the quality of the fisheries. We surveyed the watershed under experimentally reduced flows in 2016 and preliminary analyses have indicated that reduced flows (i.e., 18 cfs in Sixth Water Creek) are 1) associated with the highest Bonneville cutthroat trout recruitment on record (Figure 1, above) without 2) compromising the brown trout fishery (Figure 2, below). We used a common fishery measurement (the proportional size distribution shown here as a percentage; PSD) to test whether the sizes of brown trout in the Diamond Fork drainage were significantly lower in 2016 (a year with experimentally reduced discharge) relative to previous high water years (2002 – 2011; UT-DWR data). PSD tells us what percent of the brown trout (>150mm or 5.6″) are at or above what is considered a preferred (300mm; left) or memorable (380mm; right) length for anglers. We found that while the percent of large fish are on the lower end of observations, sizes in 2016 was not significantly lower or even the lowest observed.